Beautifully upholstered in black LeatherPlus LeatherPlus is leather that is polyurethane infused for added softness and durability. Passive ergonomic seating with built-in lumbar support. 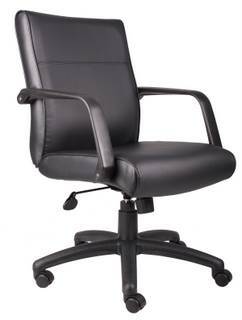 Large 27″ nylon base for greater stability. Hooded double wheel casters. Upright locking position. Pneumatic gas lift seat height adjustment. Adjustable tilt tension control.